SONEUK organised an interaction event including discussions on it’s role in the improvement of consulting services, and reconstruction of historical and cultural heritage in Nepal. Chief guest of the event Er Badan Lal Nyachhyon, the managing director of Multi-disciplinary Consultant, Nepal, and founder-president of SCAEF, emphasised that in absence of a proper system and management of development projects, and accountability of its members, various heritage sites are being neglected and thus reconstruction after earthquake has become a bigger challenge. Conducted by SONEUK General Secretary Er Umesh Parajuli, the event was chaired by SONEUK chairperson Er Shailendra Kaji Shrestha. While SONEUK Vice-chairperson Dr Birendra Shrestha welcomed all engineer guests, Er Badan Lal Nyachhyon presented his paper on ‘Challenges in heritage conservation’. He requested Nepali engineers living abroad to contribute in the development of Nepal by accumulating their experiences in developing ‘Good practice guidelines’. He added that the lack of systematic documentation and research in design, construction, repair and conservation has led to bigger challenges in heritage conservation. He pointed out that in light of government’s execution of road expansion at the cost of traditional settlements without exploring alternative options, organisations like SONEUK should present themselves as a whistleblower. While former SONEUK chairperson and advisor Er Krishna Kishore Shrestha shared his experience of facing difficulties while working with Road Department in Nepal, Er Rajesh Pathak emphasised on the need for public consultation in sensitive projects involving heritage sites. SONEUK past chairperson Er Ghanashyam Poudel suggested that in order to safeguard the heritage sites not shortlisted in World heritage list, the department of archaeology should categorise all general heritage sites. SONEUK secretary Sanyukta Shrestha informed about working towards conservation of Nepali heritage from UK. Second presenter of the event, technical director of Kadoori agricultural and association, British Gurkha, Er Narayan Gurung emphasised on the need to learn from Gorkha earthquake and not to repeat mistakes in the future. He added that rather than the earthquake itself, the damage is more due to earthquake triggered landslides and avalanche, unpreparedness and lack of awareness, etc. Participant Er Binod Lal Amatya summed up the discussion sessions with the concept of heritage-friendly metro train as an alternative to Kathmandu’s transport system, and how SONEUK could assist in this regard. 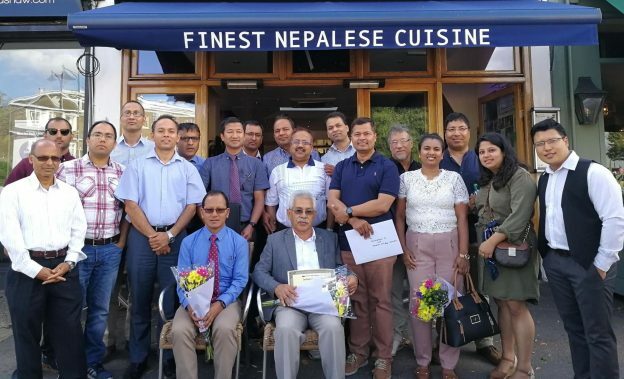 SONEUK general secretary Er Umesh Parajuli expressed his excitement on behalf of the newly formed third executive committee in light of the relevance of the discussions and participation of engineers in the event. He emphasised on the value of skills and experience gained abroad for the development of Nepal, and clarified that the committee and SONEUK as a whole is prepared to contribute in the development of Nepal. Attended by more than 30 engineers including senior engineers Dr Bidur Ghimire, Er Rajendra Kharel and Er Devendra Dahal, the event was concluded by SONEUK chairperson Er Shailendra Kaji Shrestha expressing his commitment towards liaising with SCAEF and other professional bodies. Towards the end of the program, in order to conduct events lined up for the first year of its tenure, the new executive committee declared various sub-committees and their coordinators. As a decision from the meeting of the executive committee, chairperson Er Shailendra Kaji Shrestha announced the selection of coordinators including Er Bed Prakash Bhattarai for Training & CPD, Er Dr Bidur Ghimire for Membership, Er Dr Birendra Shrestha for Conference & Seminar, Er Sanyukta Shrestha for IT Development & Project Support, Er Umesh Parajauli for Media-Public Relation as well as Constitution Amendment & Committee ToR, Er Pooja Bhagat for Young Engineers Mobilisation, Er Akshaya Chapagain for Finance, and Er Pawan Man Bajracharya for Social and Entertainment, whereas Er Sagyan Kharel and Er Rashmi Singh Rana to support the above sub-committees. Alongside, the executive committee also decided to organise a one-night camping event for the gathering of engineers’ families on 15th September 2018.